27 years from recording to releasing, the sheer journey into that is worse than the punctuality of the Swedish Post Office! 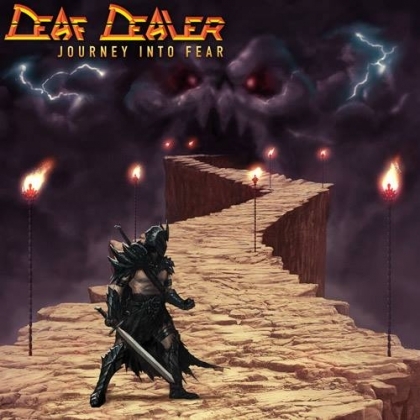 DEAF DEALER started out as DEATH DEALER back in the early eighties, and that name change is not one I recommend, but it seemingly came with a change of vocalists. New vocalist Michael “Flynn” Lalonde, guitarists Marc “Hayward” Brassard and Yves “Ian Penn” Pedneault, bassist extraordinaire Jean-Pierre Fortin, and drummer Dan “MacGregor” Gregoire recorded this fine effort in 1987 only for it to heat up the shelves until now. Not long after the release problems, the group disbanded. This lot was never the lucky ones it seems. So...has time been kind? The sheer IRON MAIDEN-esque and perennial guitar patterns make this a worthy purchase. “Back to Gods Country” is a very agile display of hands, including the adorable bass line. The sound seems highly accomplished for an album that took 27 years to really see the light of day. The high pitched refrain of “Mind Games” soon ensues, and though at least as frenetic it never reaches the opener. “Blood and Sand” is straight into the territory of “Strange World” and DEAF DEALER must have been a seemingly interesting bet for the future as they are as NWOBHM as ´Arris and Dickinson. To make things even more unfair “Tribute to a Mad Man” increases my heartbeat as Jean-Pierre´s bass is truly memorable and the guitar work and duels of Hayward and Ian Penn are extravagant. Life is so unfair... The guitar patterns never cease, the bass work is relentless, the pace might even have been too swift as in e.g. “Escape from the Witch Mountain”, which is not as cosy as a certain “Genghis Khan”... The title track ends the proceedings in super fashion. The melody is almost overwhelming, the MAIDEN-esqueness is almost gone and this must have been the moment of triumph for these Quebec lads...and then nothing. Do them a favour and buy this piece of evidence. There were more bands than IRON MAIDEN back in the heyday of heavy metal...this is proof... And if it wasn´t for Eddie who knows where this lot could have been playing a super size arena near you? They might still be as they are still around...as DEATH DEALER! !